Background: Many studies demonstrate a high rate of treatment-related adverse outcomes or adverse events. No studies have prospectively evaluated adverse events in patients discharged home from the emergency department (ED). 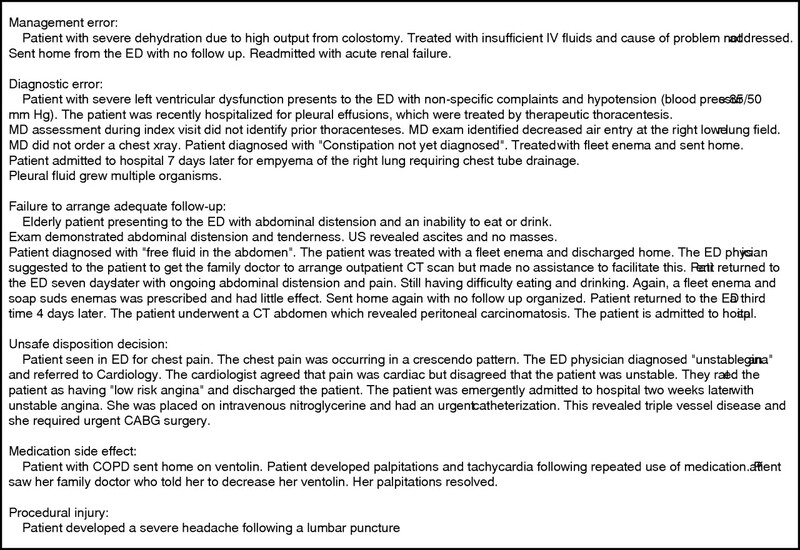 Objective: To describe the types of adverse events in patients discharged home from an ED. Patients: Patients who were sent home directly from the ED of an urban, academic teaching hospital in Ottawa, Canada. Methods: Patient records were reviewed to identify demographic and medical history information. Two weeks following the ED visit, patients completed a standard telephone interview to record post ED visit outcomes. Two physicians reviewed outcomes to identify all adverse events and their cause. Results: Follow-up was complete for 399 of 408 enrolled patients. The median age was 49 years (interquartile range 36–68) and 50% were male. The most common diagnosis was “chest pain”, occurring in 74 patients (18%), followed by “bone and joint disorders” in 55 patients (14%). 24 patients experienced an adverse event (incidence 6% (95% CI 4% to 9%)), of which 17 were preventable (incidence 4% (95% CI 3% to 7%)). Five of the unpreventable adverse events were medication side effects and two were minor, procedure-related complications. Of all 24 adverse events, 15 (63%; 95% CI 43 to 79%) led to an additional ED visit or a hospitalisation. Preventable adverse events occurred in 5 of 78 chest pain patients (incidence 6% (95% CI 3% to 14%)). Conclusion: Most adverse events occurring following an ED visit are preventable and often relate to diagnostic or management errors. Patients discharged from the ED may be prone to adverse events due to the nature of ED care. ED physicians usually do not know the patients they are treating and they may lack critical information.8 Furthermore, the ED is often overcrowded9 and chaotic.10 Finally, ED patients often require diagnostic and therapeutic interventions, which are inherently risky. Although no research has assessed adverse events following an ED visit, two studies have measured the risk of adverse events occurring after the discharge of hospitalised medical patients.11,12 Although these patients are clearly very different than those treated and discharged from the ED, the adverse event risk in this group may be informative because they endure a similar fragmentation of their health care.13 In such patients, approximately 20% are expected to have an adverse event within the first month of their discharge, and approximately one third of these are preventable. We performed this prospective cohort study to describe the types of adverse events in patients discharged from the ED. This information will help determine strategies to improve safety in the ED. We also wished to develop methods for measuring adverse events in the ED and to obtain preliminary estimates of their risk. These data will be useful to plan future large, multicentre studies. This study took place at the Civic Campus of the Ottawa Hospital. The Ottawa Hospital is a teaching hospital with emergency medicine training programmes and is the only tertiary care hospital in Eastern Ontario, Canada. The Civic Campus ED sees approximately 55 000 patients per year and is a level-one trauma centre. Patients seen in the ED are usually self-referred; however, they can also be sent by other physicians. The Ottawa Hospital Research Ethics Board approved this study. Patients were eligible for the study if they were over 18 years of age and were discharged home directly from the ED. We excluded patients who did not have a home or who were demented. We included patients presenting to our ED over a 10-week period in 2003. To recruit patients, one of the investigators (NR) remained in the ED for 8–10-hour shifts, Monday to Friday between the hours of 8:00 am and 6:00 pm. He regularly asked the ED nurses to identify patients who would likely be discharged home. If the treating ED physician agreed that the patient was to be discharged home, patients were approached for the study. Patients provided informed consent. Post-ED visit outcomes were measured by telephone interviews conducted approximately two weeks (median 15 days, interquartile range 10–25 days) after discharge from the ED. The phone interview was similar to those we have used in similar studies.11,12 During the phone interview, we determined whether patients had any new or worsening symptoms. If such symptoms were present, their severity was graded by determining how they affected physical functioning and what the patient did to resolve the symptom. We also recorded all physician visits, return ED visits, and hospital readmissions. If the patient experienced any of these events, we determined the date, location and reason for the visit. Medical records for return ED visits or readmissions were retrieved and reviewed to determine the reason for the encounter and its outcome. If ED visits or readmissions occurred at other hospitals, we relied upon the patient’s description of the outcome since the charts were unavailable. After discharge from the ED, patients had an adverse outcome if they: experienced new or worsening symptoms; visited an ED; were readmitted to hospital; or died. All adverse outcome were systematically summarised by one of the authors (AJF) using information from the chart review, the telephone interview, and information from any post-discharge ED visit or re-hospitalisation. This outcome summary included a detailed description of the date of its onset, its severity, health services used for its treatment and its resolution. When patients had more than one adverse outcome, we prepared a summary for each outcome. Two specialist physicians (an internist and an emergency physician) independently rated all outcome summaries to determine if an adverse event occurred. To do this, the physicians had the baseline patient data, the photocopied record of treatment from the index visit, and the narrative description of the outcome. We modified standard techniques for adverse event determination from previous research.2–5,11,12 Reviewers first reviewed the case and rated the severity of the patient’s outcome as “new or worsening symptoms”, an “ED visit”, a “hospitalisation” or “death”. Physician rating for potential adverse outcome aetiology. Adverse outcomes were classified as adverse events if both physicians stated: the patient had an adverse outcome and one of the potential causes was rated at least a 4 (“outcome more than likely attributable to cause”). Disagreement regarding the cause of adverse outcomes was resolved by consensus. Adverse events were classified by their cause. Diagnostic errors, management errors, unsafe disposition decisions or inadequate follow-up were classified as preventable. Adverse events due to medication side-effects and procedural complications were considered non-preventable. If the reviewers identified more than one cause for the adverse event, we chose the classification which contributed most to the outcome. For example, one patient developed an allergic reaction to a medication after the patient was discharged home, despite previously having a known allergy to the medication prescribed. The final rating for this adverse event was “management error”, while the initial rating also included “medication side-effect”. We wanted sufficient statistical power to determine the incidence of post ED visit adverse events with a 95% confidence interval (CI) range of 6%. We estimated the incidence of adverse events to be 10% based on previous research on the incidence of adverse events in medicine patients following hospital discharge and because ED patients are generally healthier.11 To achieve our desired statistical power, we needed to evaluate at least 384 patients. We describe our population using the median and interquartile range for continuous variables and frequency distributions for categorical variables. For adverse events and preventable adverse events, we describe proportion of patients affected. For proportions, we calculated 95% CIs using the Wilson score method.15 Finally, we performed tests to determine whether patient characteristics were associated with occurrence of preventable adverse events at the univariate level. For continuous variables, we used the Wilcoxon rank sum test; and for categorical variables, we used a χ2 test. As no variable was significantly associated with preventable adverse events, we did not assess multivariate models. While we were conducting the study, a total of 8578 patients were discharged directly from the ED. 2288 of these patients were sent home during the hours we were in the ED enrolling patients. Of these, we enrolled 408 patients to participate in the study. Patients in our cohort were likely sicker than those in the entire population. Compared to patients in the entire population, those enrolled in our cohort were older (median age 45 years v 49 years, respectively), had a longer ED length of stay (median length of stay 3 hours v 4 hours, respectively), and were less likely to be cared for as ambulatory patients (proportion treated without requiring a bed 67% v 27%, respectively). Table 1 describes the study population in detail. We obtained complete follow-up information for 399 of 408 patients (response rate, 98%). Fifty three patients had adverse outcomes during follow-up (table 2). Adverse outcome severity for these patients included new symptoms for 18, returning to the ED for 19, getting admitted to hospital for 15, and death for one. For 24 of these patients, the adverse outcome was judged to be due to treatment. Therefore, adverse events occurred in 6% (95% CI 4% to 9%) of all study patients. Nine adverse events resulted in symptoms only, five adverse events resulted in a return visit to the ED, and 10 adverse events resulted in a hospitalisation. No patient died as a result of an adverse event. Seventeen of the 24 adverse events were preventable (71% of adverse events, 4% of all study patients (95% CI 3% to 7%)) (see fig 2 and Appendix). Of preventable adverse events, errors in management were identified in seven cases (29%); diagnostic errors occurred in six cases (25%); inadequate follow-up planning in three cases (13%); and an unsafe disposition decision was made in one case (4%). Fourteen of 17 adverse events in which an error was implicated led to additional health services use. Examples of adverse events occurring following an emergency department visit. Preventable adverse events were not associated with any demographic or baseline factors. However, there was a trend towards patients with a preventable adverse event being older (median 60 v 47 years; Wilcoxon rank sum test p value 0.06) (table 3). Although there were small numbers of events, there also appeared to be a weak trend of increased preventable adverse event risk with CTAS levels and treatment location. The rates within CTAS scores were Non-urgent, 0%; Less Urgent, 4%; Urgent, 4%; Emergent, 5%; Resuscitation, 13% (p>0.2, Fisher test). The risk of preventable adverse event within specific areas of the ED was: Cubicles, 2%; Observation, 5%; Resuscitation, 6% (p>0.2, Fisher test). Five of the 17 preventable adverse events (29%) occurred in patients with a diagnosis of chest pain. The risk in patients with “chest pain” was 6% (95% CI 3% to 14%) which is similar to the entire population’s risk. However, no other category of presenting complaint accounted for more than one preventable adverse event. Seven adverse events were not considered preventable. They were of relatively minor consequences and were largely unavoidable. Five adverse events were medication side effects. These were predictable manifestations of particular drug class—for example, drowsiness following the use of prochlorperazine or constipation following the use of narcotic analgesia. Two adverse events were procedural complications. One was a post-lumbar puncture headache and the other was a complication of a peripheral intravenous line insertion. Figure 3 illustrates the timing of adverse events in relationship to the ED visit and the follow-up telephone call. More than 80% of adverse events occurred in the first 10 days following hospital discharge while 80% of calls were completed after this date. Proportion of calls completed and adverse events occurring within specific time intervals following the emergency department visit. Adverse event ratings by the two reviewers were only moderately reliable (κ = 0.53, p<0.05). 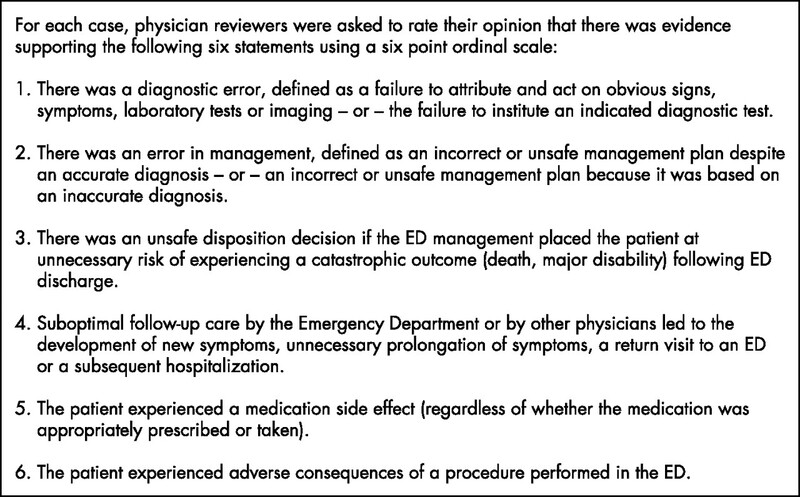 On initial ratings, there was complete agreement on 12 adverse events. Initially, there was disagreement on 19 other outcomes, 12 of which were rated as adverse events following discussion of the case. This is the first study to prospectively evaluate adverse events in a diverse cohort of patients discharged from the ED. Approximately one in 20 patients had an adverse event. The adverse events we detected arose for a number of reasons. Common problems included errors in management or diagnosis, and unsafe disposition decisions. Less common causes were adverse drug events and procedural complications. A high proportion of adverse events led to subsequent ED visits or hospitalisations. It is important to point out that we did not focus exclusively on the actions or decisions by the ED physician. Instead, we considered the functioning of the entire healthcare system. Thus, if arrangements for follow-up were not carried through then this was rated an error, even though the staff in the ED did everything possible at the time of the patient encounter. We took this holistic approach because we felt that the nature of ED care might predispose patients to system problems arising from fragmented care, a poor communication infrastructure, and patient-related issues (such as non-compliance and a high risk socioeconomic group). Other studies with similar methods evaluated medical patients following hospital discharge. These studies found the risk of adverse event to be 19%11 and 23%.12 In addition to a higher adverse event risk, post hospitalisation adverse events were less commonly preventable. This is likely because there is more time to observe the patient and establish an appropriate treatment plan when they are in the hospital compared to during an ED encounter. Other studies have evaluated diagnostic and therapeutic errors in the ED. One previous study retrospectively evaluated closed malpractice claims against ED physicians.16 This study found that several diagnoses, including chest pain, abdominal pain and fractures, had a high risk of resulting in malpractice claims. Our data confirm that misdiagnosing chest pain patients is a major contributor to ED-related adverse events. Our study has an important limitation. We enrolled only 17.5% of patients visiting the ED during recruiting hours. We had to rely on the physicians and nurses to identify patients potentially eligible for the study. While our sampling method could bias our results, we are unsure of the direction. It is important to note that we found no patient factor to be associated with adverse event occurrence. However, given that patients in our cohort were older, remained in the ED longer, and were more likely to be treated in beds, they may have been more complex and perhaps at higher risk. Alternatively, physicians and nurses may have purposefully identified low risk patients because of a possible tendency for staff to attempt to protect their professional reputation. Because of this limitation—and the fact that we performed the study in a single centre only—we are cautious about making extrapolations about the rates of adverse events in this ED or in EDs across our health system. However, irrespective of the direction of the bias, the qualitative descriptions of the adverse events affecting ED patients are useful in demonstrating the different types of adverse events effecting ED patients. Two other limitations were the duration of follow-up and the timing of patient recruitment. Because we studied the patients on average at 15 days following their visit, we likely missed adverse events occurring later. 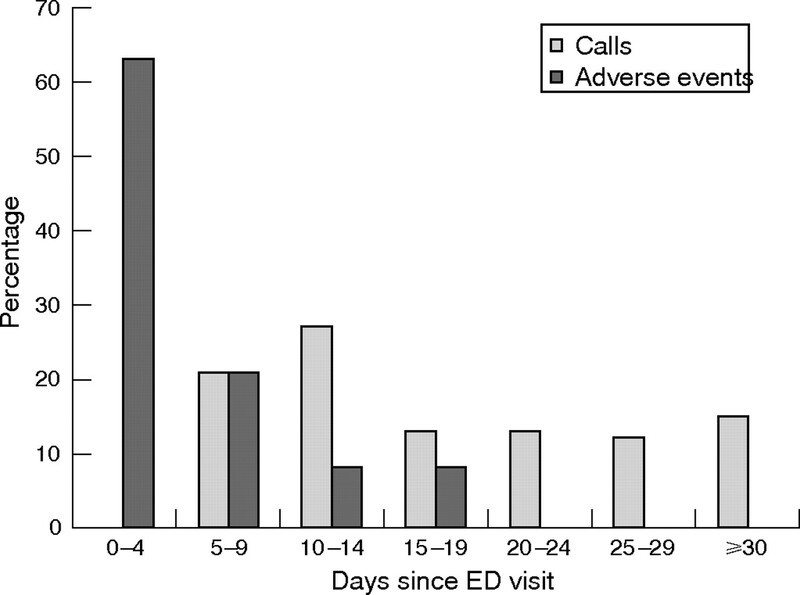 Although most adverse events occurred within the first 10 days following the ED visit, an important fraction of them occurred later (fig 3). Also, we recruited patients who were sent home during the day. During this time more expertise is routinely available, so one might expect there to be a lower risk of adverse events during this time. Furthermore, certain patient types, such as those involved in assault or alcohol related cases, may be seen outside of office hours. As these patients may not be as compliant with follow-up, they may be at higher risk of post-visit adverse events. Thus, these limitations may have led us to underestimate adverse event risk. In summary, from these preliminary data, adverse events following an ED visit appear to be less frequent but more preventable than adverse events in other settings. The greater propensity for errors to affect ED patients might result from the high patient acuity, a relative lack of historical patient information, and an overcrowded, stressful work environment.8,9,10,17,18 One potential strategy for improving care in this setting may be to standardise the management of common conditions frequently associated with adverse events—for example, through the adoption of care pathways.19–21 These pathways could involve triage decisions or could be embedded in electronic patient records for example. Alternatively, they could involve the automatic involvement of senior ED staff if certain patient characteristics exist. Before investing in such interventions, we recommend larger multicentre studies in order to confirm a similar risk of adverse events in other EDs. However, even if such studies find a smaller proportion of patients affected by adverse events, the high volume of ED cases implies large absolute numbers of patients affected and mandates urgent attention to this issue. The Institute of Medicine. Crossing the quality chasm: a new health system for the 21st century. Washington, DC: National Academy Press, 2001. Vincent C, Neale G, Woloshynowych M. Adverse events in British hospitals: preliminary retrospective record review. BMJ2001;322:517–19. Thomas EJ, Studdert DM, Burstin HR, et al. Incidence and types of adverse events and negligent care in Utah and Colorado. Med Care 2000;38:261–71. Biros MH, Adams JG, Wears RL. Errors in emergency medicine: a call to action. Acad Emerg Med2000;7:1173–4. Stiell A, Forster AJ, Stiell IG, et al. Prevalence of information gaps in the emergency department and the effect on patient outcomes. CMAJ 2003;169:1023–8. Andrulis DP, Kellermann A, Hintz EA, et al. Emergency departments and crowding in United States teaching hospitals. Ann Emerg Med 1991;20:980–6. Chisholm CD, Collison EK, Nelson DR, et al. Emergency department workplace interruptions: are emergency physicians “interrupt-driven” and “multitasking”? Acad Emerg Med 2000;7:1239–43. Forster AJ, Murff HJ, Peterson JF, et al. The incidence and severity of adverse events affecting patients following discharge from the hospital. Ann Intern Med 2003;138:161–7. Forster AJ, Clark HD, Menard A, et al. Adverse events affecting medical patients following discharge from hospital. CMAJ 2004;170:345–9. van Walraven C, Weinberg AL. Quality assessment of a discharge summary system. CMAJ1995;152:1437–42. Beveridge R, Ducharme J, Janes L, et al. Reliability of the Canadian Emergency Department Triage and Acuity Scale: interrater agreement. Ann Emerg Med 1999;34:155–9. Karcz A, Holbrook J, Burke MC, et al. Massachusetts emergency medicine closed malpractice claims: 1988–1990. Ann Emerg Med 1993;22:553–9. Fordyce J, Blank FS, Pekow P, et al. Errors in a busy emergency department. Ann Emerg Med 2003;42:324–33. Croskerry P. Achieving quality in clinical decision making: cognitive strategies and detection of bias. Acad Emerg Med2002;9:1184–204. Nichol G, Walls R, Goldman L, et al. A critical pathway for management of patients with acute chest pain who are at low risk for myocardial ischemia: recommendations and potential impact. Ann Intern Med 1997;127:996–1005. Polanczyk CA, Kuntz KM, Sacks DB, et al. Emergency department triage strategies for acute chest pain using creatine kinase-MB and troponin I assays: a cost-effectiveness analysis. Ann Intern Med 1999;131:909–18. Farkouh ME, Smars PA, Reeder GS, et al. The Chest Pain Evaluation in the Emergency Room (CHEER) Investigators. A clinical trial of a chest-pain observation unit for patients with unstable angina. N Engl J Med 1998;339:1882–8. Dr Forster is an Ontario Ministry of Health Career Scientist. Dr Stiell is a Canadian Institute for Health Research Distinguished Investigator.